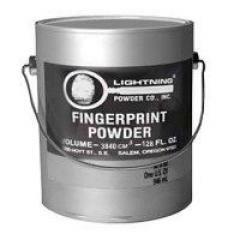 Lightning Powder 1-0068 128oz. Blitz-Red Magnetic Fingerprint Powder FREE SHIPPING! When should Blitz® fluorescent magnetic powders be used?.The choice is dependent on the surfaces which need to be dusted. Surfaces such as plastic bags or shiny magazine covers first should be fumed with Hard Evidence® pouches or Hard Evidence® Liquid Glue and then dusted with Blitzª fluorescent magnetic powder. Other smooth surfaces, like vehicles and glass, can be fumed first and then dusted with Redwop® fluorescent powder. If fuming is not practical, dusting with Redwop® fluorescent powder alone may yield results with a forensic light. Similar to Redwop® powder, our Blitz-Red® magnetic fluorescent powder fluoresces strongly when viewed under 450 nm, 485 nm, 525 nm, 530 nm and 570 nm wavelengths of light. It is applied just as any magnetic powder is dusted, using a magnetic applicator. Try using the 570 nm setting on your Forensic Light Source and view the print using red goggles. ©2002-2019 CopsPlus.com: Lightning Powder 1-0068 128oz. Blitz-Red Magnetic Fingerprint Powder FREE SHIPPING!